Content marketing is an amazing way to build your music career or drive business. Unfortunately, it’s easier to fail in your content marketing efforts than it is to succeed, especially if you don’t have a defined plan. In this episode of The New Music Industry Podcast, I share several things that holds people back from getting the kinds of results they’re looking for from their content marketing efforts. 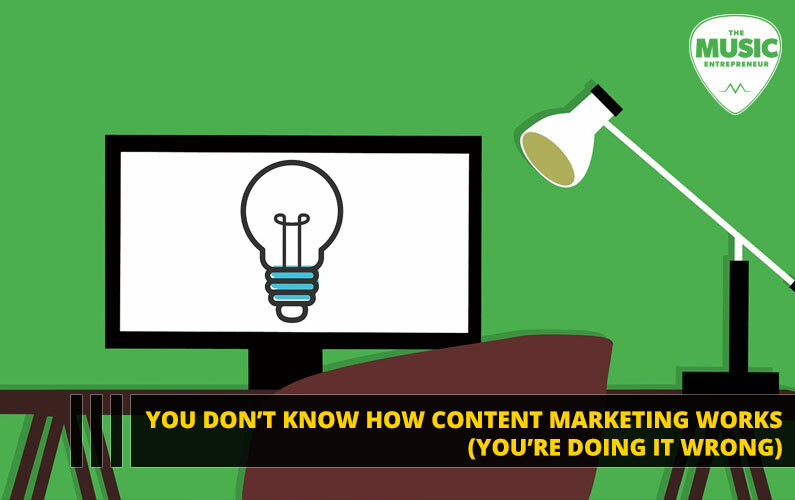 00:14 – What is content marketing? If you’ve been listening to the podcast for a while, then there’s a good chance you already know about my love of content marketing. In case you aren’t sure what content marketing is, let me borrow an eloquent description. Content marketing is a strategic marketing approach focused on creating and distributing valuable, relevant, and consistent content to attract and retain a clearly defined audience – and, ultimately, to drive profitable customer actions. If you’re creating YouTube videos on a weekly basis to attract an audience for your music, you’re leveraging content marketing. If you’re podcasting to build an audience of musicians and music entrepreneurs like I am, you’re leveraging content marketing. If you’re publishing daily articles to drive traffic to your website like Soundfly is, you’re leveraging content marketing. You can hear Ian Temple talk about this in episode 80 of the podcast. Content marketing is effective. But over the years, I’ve seen plenty of people fail at it, or arbitrarily put a stop to their initiative because they don’t see an immediate payoff. Content marketing requires a long-term mindset. Frequently adding valuable content to your site can help you get more organic traffic. If you’re serious about search engine optimization, then you simply can’t ignore the importance of creating content. But for better or for worse, whatever actions you take to optimize your site today probably won’t produce results for six to 12 months. Publishing on a regular schedule. It can be tough coming up with content ideas and creating something new every day, three days a week, once a week, or whatever the frequency. But if you treat every content piece like an experiment and track which of your experiments bear fruit six to 12 months down the line, you can get a good sense of what type of content attracts your audience and create more of it. Publishing quality content sporadically. This strategy seems to work well for people like SEO expert Brian Dean. He doesn’t publish all the time, but when he does, he puts out posts that are jam-packed with a ton of value. He spends a lot of time researching keywords and ideas before he even dedicates time to writing the post. Then, he proceeds to market these posts with every bit of enthusiasm he can muster. That’s a key point. Meanwhile, I’ve seen some people take a third approach, and I have yet to see this work. They stop and go, rinse and repeat. They publish a few pieces, try to measure their effectiveness, and then pause while they assess whether what they published worked. Inevitably, these people get left in the dust because there are plenty of other people publishing valuable content on a more frequent basis. Now, don’t get me wrong – I do believe in getting every bit of leverage out of a content piece. But unless you’re producing at the level that someone like Brian Dean is, you’re not going to impress anyone with your 300-word blog posts. You must find your balance. If you’re going to be publishing frequently, you’re probably not going to be spending as much time researching, distributing, and marketing your content. But it’s like chipping away at a piece of granite. Every piece of content you publish can help you move toward your goals of attracting an audience and selling to them. If you’re going to be publishing less frequently, then you should be spending more time in research. And, because you’re going to be spending a lot of time writing, you don’t want that piece of content to go to waste. You should also spend a lot of time distributing and marketing it. Stopping and going does nothing whether you look at it from the perspective of your audience, or the perspective of search engines. If you’re only going to be sharing bit pieces, your audience is going to want to hear from you more frequently. There’s nothing wrong with snackable content, but you must publish a lot of it to keep that traffic coming in. This will also send a signal to search engines that you’re creating something worthwhile. I believe in creating quality content. But I’m not obsessive. I believe Seth Godin was right when he said, “just ship it”. Once something is out in the world, you can get feedback and gauge people’s response to it. So long as it’s sitting on your hard drive and you keep tweaking it, you’re wasting a lot of time that could potentially be better allocated. You must leave perfectionism at the door. Okay, I admit. I’m voicing one of my frustrations as a ghostwriter here. They don’t have time to write their own content. They don’t view publishing content as a high value task. They don’t enjoy writing, or they aren’t very good at it. Unfortunately, people hiring ghostwriters tend to have a lot of unrealistic expectations around what a ghostwriter can offer. You must realize that a ghostwriter tends to have many clients, not just one. So, if you want their full, undivided attention, you should consider hiring them full-time. Why is this an issue? Because many entrepreneurs and businesses want perfect content. What does “perfect” mean? Well, it’s entirely subjective of course. But there can be a myriad of other factors often not considered by people hiring ghostwriters. You might have certain regulations you need them to adhere to. You might require the ghostwriter use certain industry jargon or terminology. Or, you might even need the ghostwriter to follow your style guide. But you’d be amazed at how many businesses don’t have a style guide, and when they do, it’s so long and detailed no one could possibly absorb it in a few tries. It can take ghostwriters awhile to sus out one’s exact needs. But again, I must also go back to what I said earlier. Assuming the ghostwriter is working with many clients, their attention is going to be divided among them. And, if they’re getting paid the same across the board, there’s simply no way for them to prioritize your project over others. Can you see how this would put a serious damper on how much content one could publish in a given timeframe? Certainly, you don’t want to put out subpar content. But you also shouldn’t take forever putting together something that may not even be read, heard, or viewed by your audience. You could spend hours, days, weeks, months, even years on it, and when you finally publish it, there’s no guarantee it will get a response. Now you know why an editorial calendar and deadlines are amazing tools. If you know you must create another video by next week, you’ll find a way to put it all together – even if you must cut a few corners or simplify the concept to achieve the desired result. I once interviewed Jack Conte. He told me that one of the obstacles he had to overcome was letting go of perfectionism and publishing songs when they weren’t finished. I don’t see the word “perfection” in Content Marketing Institute’s definition of content marketing. I do see the words “valuable”, “relevant”, and “consistent” though, and that should be your goal. What are your goals? What do you hope to achieve with content marketing? How do you plan to reach those goals? I can only assume that a lot of people stop and go because they don’t have a strategy and they’re constantly second guessing themselves. So, they try writing 300-word blog posts for a week. Then, they try their hand at podcasting but quit after a month. Then, they sporadically publish videos for the next four months. Now, I’m all for experimentation. But if this is how you’re approaching content marketing, I can tell you right now Kim Kardashian is more organized than you are. Just look at her Instagram feed. At The Music Entrepreneur HQ, we publish blog posts on Tuesday, podcast episodes on Thursday, and weekly digests on Friday. This is always subject to review, and sometimes we publish more, sometimes we publish less. But as a basic guideline for what to achieve each week, it works. Our content is geared towards musicians and music entrepreneurs. We believe in simplifying difficult concepts and explaining them in plain language. We believe in helping artists think outside the box. We believe in empowering artists and in helping them adopt a strong mindset. If you can get your thinking right, a lot of other things tend to fall into place. This is a general overview of our content strategy. So, what’s your content strategy? Do you have a plan? Do you know who you’re trying to talk to and appeal to? What is your publishing schedule? What type of content are you creating to attract your target audience? Thinking about these questions will help you turn your thoughts and ideas into a concrete strategy that can produce results. And, if it doesn’t produce the kinds of results you’re looking for, you adjust your approach and try again. Per CMI, content marketing is about consistent content, so consistency is of the essence. Don’t stop and go. Don’t wait for perfection. Do create a written plan. Then, execute, execute, execute.